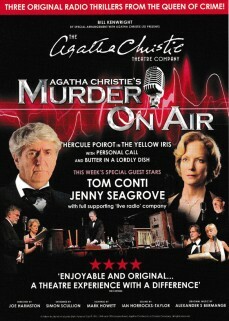 Guest Stars Tom Conti, Jenny Seagrove, Sara Crowe, Roy Marsden, Tony Roper, Barbara Rafferty. Cast: Sonia Saville, David Partridge, David Osmond, Elzabeth Price, Simon Linnell, Alexander S. Bermange, Adrian Metcalfe. Three gripping radio thrillers from the Queen of Crime, read in an authentic studio setting with live sound effects, in the style of their original BBC broadcasts. Joining each performance will be two special guest stars accompanied by a full supporting company of players. Enjoy the thrilling nostalgia of 1930s BBC radio drama, live on stage.